Long Island, located at the turning circle of the cancer is one of the most beautiful islands of the Bahama-Archipel. Peaceful, green hills, fertile fields of Banana- and Pineappleplantations and a lot of green offer a varied Landscape. One side of the island is with endless icing - white sandy beaches and the smooth turquoise-blue carribean sea surrounded. The other side got its character from the surf of the atlantic with countless sandy bays and rocky reefs. As you may expect by the name, this Island is long (70 mls) und narrow (max. 3mls). Nearly 3000 Islanders live in tiny villages lying along the only Islandstreet. Since a few years they have phone and electric supply. Kolumbus landing here 1492 described this island as the most beautiful he had ever seen. The Bahamas Dollar has the same rate of exchange as the US-Dollar. Both currencies are used. On the Out-Islands bank-services are often limited. The most usual credit cards are accepted. Far better are Traveller Checks in US-Dollar and cash in small notes. You should try the local specialities, which are real cheap. 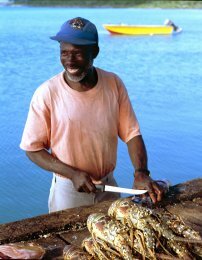 Check out Grouper, bahamesian lobster and Conch(*, served in a great variety. The medical support is at american standard. The European "private health insurance"(*2) is normally valid on the Bahamas, too.There are a doctor and a clinic on Long Island. (*2) if you got a legal health insurance you should conclude a private health insuarnce. There are a few car rental services on the island. Most important is driving on the left side an the speed limits. Scooters and bicycles can be rented as well. The dressing is relaxed. Most of the time you wear swimsuit, shorts or light sportswear. 120 V / 60 Hz as USA. The time on the Bahams has to be put back 6 hours compared to MEZ. A good telephone- und faxnet connects the islands with Europe and the World. Directdial on Long Island is possible.